Order ink for HP PhotoSmart 100 printers and enjoy a variety of low-cost options. Our remanufactured HP ink cartridges are available as individual black and color units, as well as competitively priced 2-packs for customers in need of additional ink. All of our products are tested and guaranteed to be fully compatible with your printer. We design our replacement HP 56 ink cartridges to match the specifications and standards of your original black HP PhotoSmart 100 ink, ensuring consistent print quality on every page. 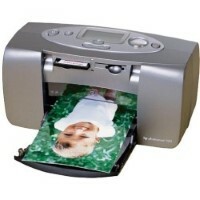 Combined with the tricolor HP 57 ink, your photo printer will perfectly replicate the depth and clarity of your images from your camera to the page. Both units come with a full 1-year warranty and a 100% satisfaction guarantee for your convenience.